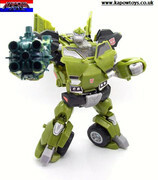 Hier kommt ein Review von Kapow Toys zu Transformers Prime AM-10 Arms Micron Voyager Bulkhead. Viel Spaß damit! Alle Bilder und das Review unter mehr! 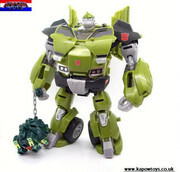 When the first images of the RID Bulkhead figure surfaced you could hear the cries ring out across the known universe however shortly after his release people realised he was actually a pretty awesome little dude and worthy of their time, the Arms Micron version is worthy of even more of your time simply because he has an obese wrecking ball buddy along for the ride. 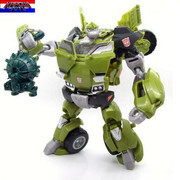 Coming in a different shade of green to the RID version Bulkhead needs his stickers applied ala all Micron figures, now you will either hate this or find it transports you back to those nostalgic 80's when you plastered not only your transformer figure with decals but all the box, inner foam and anything else you could get your hands on. 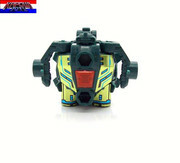 The Micron himself comes on a sprue and is actually all round good fun to assemble, its simple click clunk stuff and does not require any real skill........................hence how I managed to put it together. 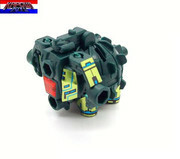 Once assembled the Micron transforms into a wrecking ball or blaster both of which are pretty awesome, the 3rd mode however which is supposed to be the robot comes across as robo jabba which I'm lovin I do however expect some people will not. 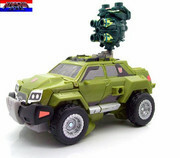 Bulkheads robot mode is full of articulation, its been said by some he is too thin and somewhat resembles a himself prior to the pie abuse, I have to disagree and say his proportions are really good unless your looking side on. 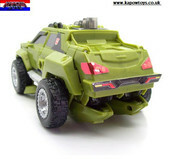 Vehicle mode is the bog standard toon 4x4 and its done well, you can see a little kibble poking out from underneath but nothing that will worry the sheep, the stickers will need to be applied otherwise you will end up with no windows and a very bland looking green car resembling something akin to the Little Tykes Super Coupe! 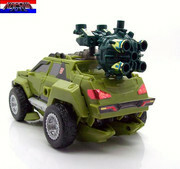 The micron can be mounted on top of the roof making it look like a P.A system used for local elections or on the rear of the truck forming what looks like a booster engine. 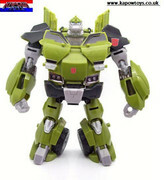 Overall Bulkhead scores a bulky 8/10 and over all awesome bot!